The existence of "no-go zones" in predominantly Muslim areas in Europe has been a major topic of conversation since the latest Paris massacre on Nov. 13, primarily due to the assailants' many connections to Molenbeek, a heavily Muslim district of Brussels. This discussion brings to mind my visit to a drug- and crime-infested slum of 7,000 inhabitants in Marseilles, France, on Jan. 29, to see the situation for myself. 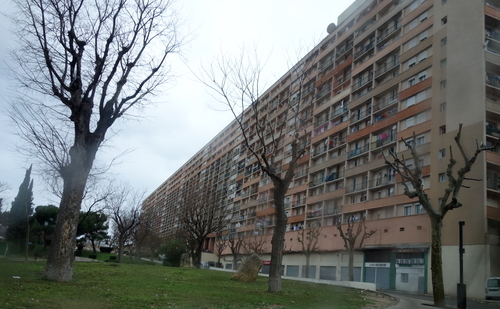 A typical housing block for immigrants in Marseille, France. I entered the housing complex in an unmarked but recognizable city-owned car driven by a city employee who had been tasked with showing me around. Unfortunately, being mostly a paper-pusher and not experienced in the field, he got spooked and abruptly turned around to leave, raising suspicions among the drug dealers around us, who proceeded to set off the alarm. A motorcyclist and a truck then zipped ahead of us and boxed us in on a nearby highway. Sitting in the car's front passenger seat, I was accosted and threatened by four young thugs. The city rep pleaded with them, telling them I was a visiting sociologist. They responded first with threatening comments and then by throwing a piece of concrete the size of a football through the back window. Luckily no one was injured, and they let us leave after the intimidating incident had concluded. I provided the mayor's office with audio, video, and still photographs of the thugs and their license plates. I have kept quiet about this incident for ten months in the hopes that the French judicial system would function. As of today, however no one has been apprehended, no charges have been filed, and to my knowledge, no real investigation ever took place. This incident was the great exception to my 28 other visits to predominantly Muslim areas in Australia, North America, and Western Europe. In all of these places – call them ZUS (French: Zones Urbaines Sensibles, or Sensitive Urban Zones): I "went" without problems, traveling sometimes alone, sometimes not, in an anonymous rental car during daylight hours wearing normal Western casual male clothing – not in a police uniform, a priest's habit, skimpy clothing, or with a kippa. In many ZUS, I got out and walked around; nearly everywhere I took pictures. In some, I stopped and made purchases, had a meal, or visited a mosque. I did nothing provocative like evangelize, march in a gay pride parade, recruit for the army, or take pictures of drug dealers. I was not a threat. I then "left," none the worse for the experience. My forays into the ZUS suggest that they are in fact go-zones for innocuous civilians. Even in Marseilles, had I shown up in a rental car, the thugs would likely have welcomed me as a potential drug customer. In contrast, Brice De Ruyver, the former security adviser to a Belgian prime minister, has stated that "We don't officially have no-go zones in Brussels, but in reality, there are, and they are [found] in Molenbeek." Yet, I drove and walked about Molenbeek, also in January, freely taking pictures of people on the street, stores, and whatever caught my fancy, and no one paid me attention. I felt completely safe. 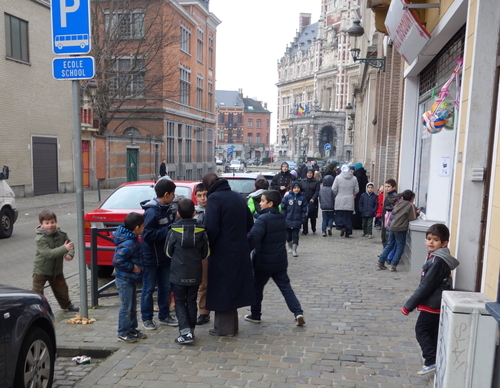 A street scene in one of the heavily Muslim areas of Brussels, taken as I walked solo through the neighborhood. Likewise, I earlier strolled through Rinkeby, a notorious district of Stockholm, on a November 2014 afternoon without encountering so much as a hostile stare; yet a local policeman has testified in reference to Rinkeby that, "If we're in pursuit of a vehicle, it can evade us by driving to certain neighborhoods where a lone patrol car simply cannot follow because we'll get pelted by rocks and even face riots. These are no-go zones. We simply can't go there." How to reconcile these experiences? My visits establish that non-Muslim civilians can usually enter majority-Muslim areas without fear. But things look very different from the governmental point of view. On a routine basis, firefighters, ambulance workers, and even social workers meet with hostility and violence. For example, days after I visited the Marseille slum, its residents shot at police preparing for a visit by the prime minister of France. Thus does it and its ilk represent a no-go zone for police, a place which government representatives enter only when heavily armed, in convoys, temporarily, and with a specific mission. The term no-go zone is informal (apparently deriving from American military argot); dictionaries ascribe it two meanings in line with my conclusions: either (1) ordinary people staying away from an area out of fear or (2) the representatives of the state entering only under exceptional circumstances. ZUS do not fit the first description but do fit the second. 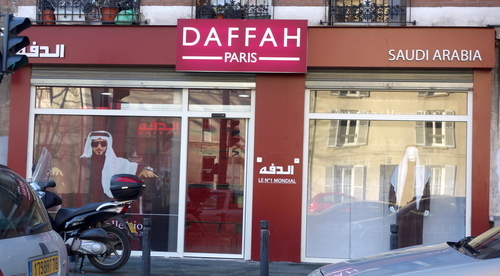 One of the more interesting stores I saw in the Paris suburb of St. Denis. Whether or not Molenbeek, Rinkeby, and the Marseilles slum are no-go zones, then, depends on what aspect one choses to emphasize – their accessibility to ordinary visitors at ordinary times or their inaccessibility to government officials in times of tension. There are also no-go gradations, some places where attacks are more frequent and violent, others less so. However one sums up this complex situation – maybe partial-no-go zones? – they represent a great danger. Dec. 2, 2015 addenda: (1) This is my third and – I hope – final assessment of the no-go zone issue. The first was in 2006, when I translated the official French designation of Zones Urbaines Sensibles (ZUS) as no-go zones. The second was in January 2015, when I revoked this term on the basis of personal experience. Now, here, I find it partially applicable and partially not, where they are no-go zones primarily for representatives of the state, regardless of religion. 6 areas outside Europe: Dearborn and Hamtramck, Michigan; Lodi, California; Queens, New York; Mississauga, Canada; and Lakemba, Australia. 7 in Europe outside France: Antwerp, Athens, Berlin, Brussels, Copenhagen, Malmö, and Stockholm. 7 in France outside Paris: the ZUS in Beziers, Lunel, Marseilles, Montpellier, Nice, Perpignan, and Toulon. 8 in the Paris region: Barbès–Rochechouart, Belleville, Clichy-sous-Bois, Clignancourt, Gennevilliers, Sarcelles, Seine-Saint-Denis, and Val d'Oise. American Heritage: "an area into which entry is forbidden, restricted, or reputed to be dangerous." Cambridge: "an ​area, ​especially in a ​town, where it is very ​dangerous to go, usually because a ​group of ​people who have ​weapons ​prevent the ​police, ​army, and other ​people from ​entering." Collins: "a district in a town that is barricaded off, usually by a paramilitary organization, within which the police, army, etc, can only enter by force." Macmillan's: "an area in a town that is not considered to be safe because there are high levels of crime and violence there." Merriam-Webster: "an area into which entry is forbidden or dangerous." Dec. 9, 2015 update: Raheem Kassam at "UK Cop: 'There Are Areas We Have To Ask Muslim Leaders' Permission To Patrol'," confirms the distinction above between state representatives and others. Note in particular the testimony by the police officer who says that he's not allowed to travel in his uniform but should look like a civilian because he's safer that way.